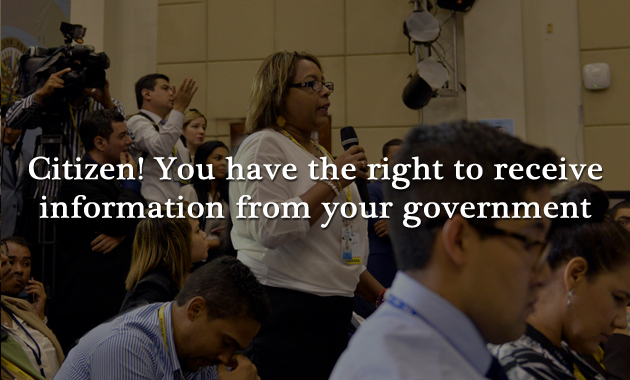 Recognized as “a human right,” access to public information is an essential element for the functioning of democracy. The principles of the Inter-American System of Human Rights and the OAS Model Law on Access to Public Information have contributed to the improvement of special laws on the matter. 26 OAS member countries now have laws on the issue, with Argentina the latest case. In Chile, any citizen can find out the salary and benefits of any public servant. In Mexico, the public can find out how much the state spent on the athletes that represented the country in the Olympic Games in Rio de Janeiro or find out the number of accidents that have taken place on a certain highway. In Argentina one can find out how much the government spent in paid advertisements in the media. An in Uruguay, it is possible to find out whether or not the country’s schools are equipped to prevent fires. These are just a few examples of how citizens of the region can and have made use of their right to public information, a cornerstone of the democratic system and a key to accessing other rights. In the Americas, Argentina recently approved its law on access to public information, which took as a reference the OAS Model Law approved by the General Assembly in 2010. With the approval of this legislation, there are now 26 countries of the region that have such laws. For the Rapporteur for the Freedom of Expression of the Inter-American Commission on Human Rights, Edison Lanza, the approval of a law on access to public information marks a “before and after” in the history of a country. “It marks the difference between a history and culture of secrecy that the majority of our countries in the region cultivated and a culture in which public administration and the state begin to function in a more open way, facilitating access to information in the hands of the state for the people,” he said. In principle, all information and documents held by the state should be public: from birth certificates and government expenditure receipts to contracts for transportation and data on pollution in rivers. Access to this information allows the citizenry to demand accountability, to know how to access other rights and to monitor the compliance with the promises made by authorities. It allows citizens to monitor government actions and effectively participate in decision-making affecting them. It allows for governments accountability to citizens. It helps to fight corruption, nepotism, and mismanagement. Moisés Sánchez, Executive Secretary of the Regional Alliance for Free Expression and Information. For Moisés Sánchez, former Executive Secretary of the Regional Alliance for Free Expression and Information, the significance of access to public information goes beyond the big issues of democracy and the responsibilities of government: it has practical consequences for citizens. “It allows citizens to learn about issues that also serve to improve their quality of life. For example, finding out the most qualified health facilities, which schools give your children the best education or even where to choose to make their homes. It serves social control but also serves fundamentally to improve the quality of life of the people,” he said. The role of the OAS in this issue has its origins in a mandate of the General Assembly in 2009 to elaborate a Model Law on Access to Information and a guide to its implementation. The Model Law, which contains 72 points and extends for 25 pages, was produced by a group of experts in a process led by the OAS Department of International Law and approved by the General Assembly the following year. Since then, it has served as the basis for numerous draft laws in countries debating legislation in this area, and as a reference for countries looking to adjust existing laws to the standards of the Inter-American Model Law. Edison Lanza, Rapporteur for the Freedom of Expression of the Inter-American Commission on Human Rights. To promote training programs for judges and national courts on the proper enforcement of judicial guarantees to protect the right to access public information. The Special Rapporteurship for the Freedom of Expression has also played a key role in promoting and protecting the right of access to information. This expert office of the IACHR monitors the situation of access to information in the hemisphere, promotes best practices through thematic reports and works and raises cases of violations of this right before the Inter-American Court. As the approval of the new law in Argentina shows, there is a growing consensus among the countries of the Americas concerning the recognition of the right to information as a cornerstone of democratic systems. In all the countries with laws on the issue, one finds the principle that the access to information is the rule, and secrecy the exception. The inclusion of the 3 powers of the state and the businesses that include state participation among subjects of the laws. The universalization of the right to request information from the state anonymously. The regulation of the exceptions to the right of access. In some cases the legislation itself presents some difficulties and in others it is the interpretation and application of said legislation that has generated problems in the implementation.